NOVEMBER 2017 • E&MJ 71 www.e-mj.com PROCESSING SOLUTIONS be balanced almost completely, according to the company. This reduces machine vibration when idling and signifi cantly lowers stress on surrounding structures when compared with other primary crush- ers — making it well suited for mobile crushing systems. Torsten Gerlach, CEO of the Mining Technologies business unit of thyssenk- rupp Industrial Solution, said, "Our cus- tomers are looking for dependable, safe and easy-to-install crushers that permit maximum productivity even underground. To meet these requirements, we have combined our many years of experience with different crushing technologies and our comprehensive engineering expertise. 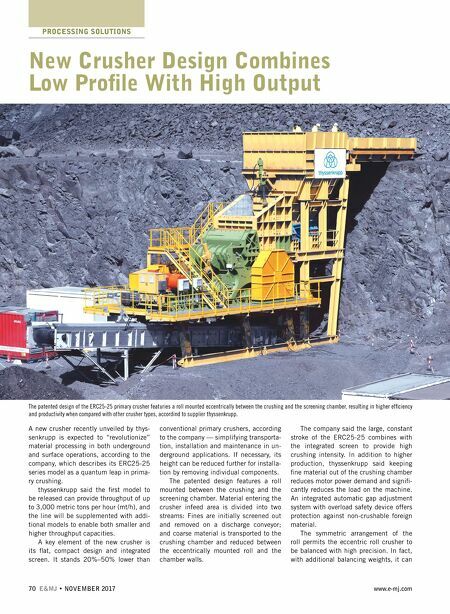 "The new eccentric roll crusher offers a wide range of possibilities for effectively processing ore and hard rock both under- ground and on the surface as part of mo- bile and semimobile systems." Ore Sorting Tests Point to Process Effi ciency Dalradian Resources, a Canadian junior exploration and development compa- ny, announced positive ore sorting test results based on a bulk sample of min- eralized development material from sev- eral of the veins at its Curraghinalt gold project in Northern Ireland. Testing was carried out by Outotec at their TOMRA sorting test facility in Wedel, Germany, on approximately 5 metric tons (mt) of material grading 9.52 grams/mt of gold. Using X-ray and laser technology, plus ad- ditional screening prior to processing, the amount of non-mineralized material that would be sent to the mill in an operat- ing mine was reduced by 35.8% and the grade increased by 54.6% to 14.72 g/mt of gold with a gold recovery of 99.3%. Similar results would be expected if implemented into a mine-scale situation, according to the company, which noted that ore sorting technology has been used in diamond processing operations for many years and is now used with a vari- ety of other commodities including tung- sten and gold. The ore sorting process has become increasingly effi cient with advancements in X-ray, laser and com- puter technology. It was anticipated that ore sorting would be a good fi t at Curra- ghinalt because of the large contrast in density and color between the high-grade quartz-sulphide veins and the surround- ing country rock. Dalradian said throughout the test- ing, the ability to effectively sort the ore from Curraghinalt was clearly demon- strated. Using only X-ray technology with rougher stage material, waste removal of 50.5% with a gold recovery of 97.8% was achieved. When the laser scavenger step was added, which is used to recover additional mineralized material from the X-ray waste material, total gold recovery increased to 99.3% at the expense of a decrease in total waste removal to 35.8%. Optimization of the proposed process, in- cluding a cost benefi t analysis of the sec- ondary scavenger circuit, will be needed prior to implementation of the technology. Eric Tremblay, Dalradian's COO, said, "These are very good results. Indepen- dent testing proves our high-grade gold is easily sorted from waste. We plan to in- vestigate it further by visiting operations using the technology prior to designing our own ore-sorting infrastructure for in- clusion in an updated feasibility study." The company said ore sorting has the potential to considerably reduce costs at the mill by decreasing the amount of ore processed to produce the same number of ounces. Applying the results of the testing to the Curraghinalt deposit Min- eral Reserve Estimate would potentially eliminate approximately 1.87 million mt of non-mineralized material prior to pro- cessing. Using the base case feasibility cost estimate of $27.8/mt for milling, this could result in savings of $52 million against a revenue loss of approximately $12.6 million (at $1,250/oz) due to re- covery being reduced by 0.7%. Application of ore sorting also has the potential to decrease the cut-off grade, which would result in more mineable ounces and increase the throughput of the mine. Heron Finds Grinding Solution for Woodlawn Plant Heron Resources has selected IsaMill grinding technology for its Woodlawn zinc-copper project, located 220 kilo- meters (km) southwest of Sydney, New South Wales, Australia, at the site of the former Woodlawn mine, which contains reclaimed tailings and underground min- eral reserves. Des O'Sullivan, process manager at Heron Resources, said the project need- ed a versatile, proven fi ne-grinding tech- nology as the mill will handle zinc-rich reclaimed tailings as well as polymetal- lic primary ore in different processing modes, and the IsaMill was the candidate that best fulfi lled those requirements. Glencore Technology will supply a 3-megawatt (MW) M10,000 IsaMill and IsaCharger media delivery system, as well as commissioning services. According to Glencore, Woodlawn is the second project this year that has chosen to use an IsaMill for processing base metals from reclaimed tailings. Paul Telford, Glencore Technology general manager, said, "This will be the 15th M10,000 IsaMill installed. This certainly gives our clients peace of mind that we can provide technology that can achieve the high demands of fi ne grinding duties." XRT sorting equipment from Outotec is shown here in use at the Minsur tin plant in Peru. 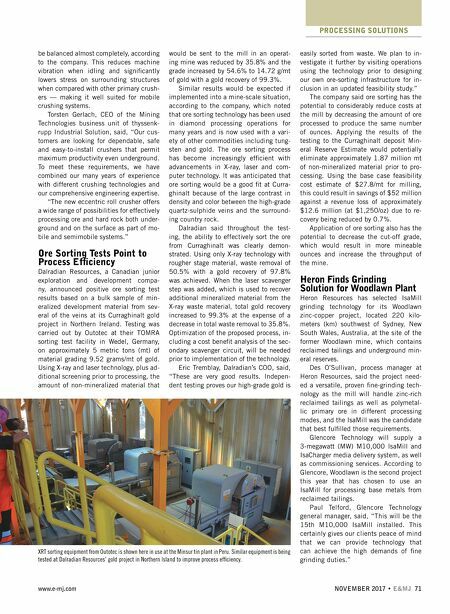 Similar equipment is being tested at Dalradian Resources' gold project in Northern Island to improve process effi ciency.